It's the first Friday of August and the last day of our Cornish holiday. Yay and boo! We've been very lucky this year and have had decent wifi all week at the farm--very useful for finding wet weather attractions--so I've kept up my late-night surfing habits. 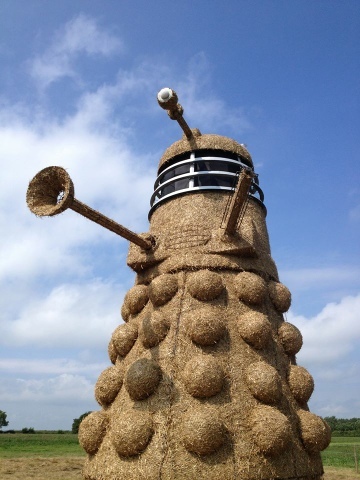 A 35-foot tall straw sculpture of a Dalek in a Cheshire field! How amazing is this? It's certainly a unique way of celebrating the 50th anniversary of Doctor Who this year. I was just going to bake some Dalek cookies with Lucas...this is going above and beyond! Isn't this amazing? 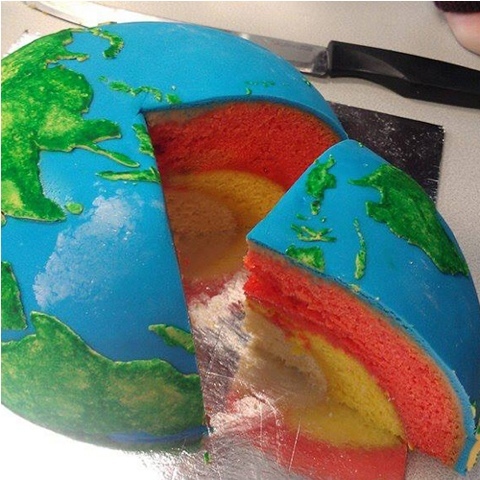 The Southern Hemisphere of the Earth lovingly rendered in different flavours of cake, complete with inner-core, outer-core, mantle, and a perfectly vibrant blue crust. The same baker has also made a complete sphere copy of Jupiter, but I have a soft spot for our beautiful blue planet so I wanted to show it some love!